I am angry with the world of publishing. A few years ago, a saw a bunch of posters for 'the black swan' (the book, you dolt), and was basically suckered into buying it. it sounded like freakonomics, but more high-brow, and obscure, or something. It looked like exactly the book i wanted to read. let's say there's a power law that relates how things that happen frequently don't change the world very much, and as things get more important, they get more rare. so far, so obvious. Taleb marries this to the long tail, and a pinch of chaos theory - the rarer, and therefore harder to predict, something is, the more it affects the world. right at the end of the tail, you get things that almost never happen, that totally change everything, that you could never predict. i really like that idea, even if it is pretty pessimistic. but Taleb runs with, makes up a load of fictional evidence - i'm not kidding, he tells a story that he cites as evidence and then admits he made it up - and furthermore, the idea is fairly self-defining and tautologous. but what really irks me is beyond the book, and goes back to penguin's marketing for the book. my excellent brother Dan recommended i read Iain M. Banks*' books "excession" as grist for the conceptual piece we're working on. i've just finished it, and it's a pretty complex book, but very good if you can keep up with it, or just surf along not understanding, knowing that what's going on will probably make sense when you get a few more chapters in. The plot deals with an "outside context problem", the kind of problem "most civilisations would encounter just once, and which they tended to encounter rather in the same way a sentence encountered a full stop." i was reading the wikipedia page on excession, and guess what i read: "The situation has been more recently described as black swan theory." 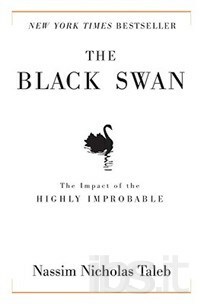 The link leads to a page on black swan theory, not the book itself, as if Taleb had any kind of formal definition of the theory, or had written an academic paper not a straight-to-paperback pop-science book. edit: the link to the black swan theory page is also in the opening paragraph of the article. which is wierd. this page is basically just an advert for the book (there is some discussion on the talk page as to why it exists and how it should be merged into the page for the book); and what are the chances of me coming across this link - unless it's not as uncommon as i expected. so i started thinking - have they just plastered the link all over wikipedia? what about the rest of the internet? a quick site search brings up 113 pages that mention 'black swan theory' - many of which are talk pages or user pages and so on. but that's still a lot of pages directing wikipedians towards this page. a broader search brings up 259 pages across the internet that link to it. I'm unable to tell how many of these are people using the term in general parlance, and how many are what i suspect - deliberate insertions of the link across the interweb to boost sales of the book by viral marketeers. I say 'viral marketeers' because they're linking to the 'theory' not the 'book' - they're selling an idea, not a product. they're trying to turn wikipedia, which is freely editable, into a web of adverts. I hate that. *nothing to do with 'rosie m. banks', the author bertie wooster pretends to be in jeeves and wooster. On a different tack, the recent controversy over the Old Man Murray page on wikipedia really reminds me of arguments between Minds in Excession. there's something about the anarchy - as in, self-organisation - the independence, the distance between people. we depend upon them, and when individual ones become corrupted by the power, the group steps in to set things right. the user who suspended the OMM page has been reprimanded, and the comments here are just like dialogue between various characterful craft. the thrill of peeking behind the curtain is just the same in excession (where the human's plotline is completely pointless) as with wikipedia.